If you’re looking for unique treasures to add to your gem collection, I present to you: Tucson Well Offerings! Every year, people from around the world gather in Tucson, Arizona, for the largest international gem show the world has to offer. The show’s roots began with a small gathering of geologists, but today, the show attracts a wide variety of spectators and collectors. With these Tucson Well Offerings, you will receive stunning pieces intuitively chosen by me, from the collection of extraordinary gems and minerals that I took home from this year’s gem show. Each piece is extraordinary and powerful in its own unique way – and the one that is meant for you is waiting to make its way to your altar! Not many people talk about the spiritual meaning of the Tucson Gem Show – but I’m here to share a piece of it with you now. To begin, Tucson itself is a major energetic vortex in North America, sitting along an important ley line in the center of powerful mountain ranges. This city is an ancient caldera, where volcanic activity yielded to erose and rock slides, to create the dramatic landscape of color and texture. The energy of fire from this ancient volcanic activity, united with the desert rain, wind, and minerals of the land, makes for a beautiful balance of the four cardinal elements. Healers and shamans travel to the Tucson Gem Show each year, believing that the presence of the four elements in this city’s natural environment creates a strong energetic foundation that amplifies the energy of every crystal and mineral discovered within it. I recently had the honor of traveling to this extraordinary event myself and was thrilled to get my hands on some of the most incredible pieces its vendors had to offer. And of course, I can’t keep all of this magic to myself – which is why I’m sharing it with you now. 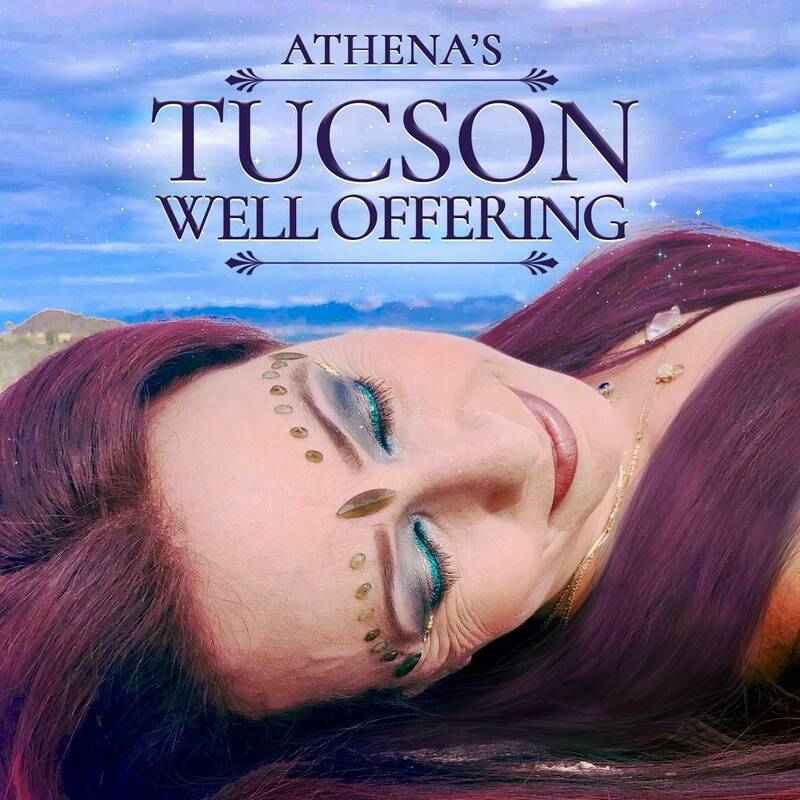 With this offering, you will receive intuitively chosen treasures straight from Tucson, alive with all of the potent magic its sacred land has to offer. The pieces I have ready for you all are so special – and include ones that you have probably never seen or even heard of before! The treasures that you receive are sure to be beautiful and energetically potent beyond belief, ready to transform your life and practice. The Tucson Gem Show is truly an incredible place – and I’m so excited for you to harness a piece of its magic for yourself. With your specimen from the show, you’ll also receive over $40 in free gifts, including a free additional stone that we found in Tucson AND a 10 ml bottle of my brand new perfume: Desert Rain. Every ingredient in Desert Rain Perfume was charged in Tucson and each bottle comes infused with a clear quartz chip stone, for amplified power. The Tucson Gem Show is truly an incredible place – and I’m so excited for you to harness a piece of its magic for yourself! This listing is for one (1) Tucson Well Offering and one (1) 10 ml bottle of my Desert Rain Perfume. I have five price points to offer you: Calyx ($35), Glass ($50), Chalice ($75), Well ($150), and Source ($300). Please choose the price point that calls to you from the drop-down menu above. Yours will arrive lovingly parceled for your enjoyment. I purchased the glass offering for myself and one for my friend. It was stuffed full of beautiful offerings. Candles, jewelry, perfume, tumbled stones, and a large showcase piece! I love my optical calcite cluster. It sits inside my front door raising the vibration for all who enter. I also purchased the calyx offering for my kids. It was small but beautifully put together. I plan to make Easter baskets with them. Very satisfied with my purchases! I loved everything in my well offering! I will be ordering again soon! These Well Offerings are always value for money! My Tuscon gem is a Zeolite cluster. Can I just say WOW! Love it! I am in tears and feel so abundant and blessed by the beautiful well offering I just received. The Sage Goddess team really felt into my energy and sent to me what I didn’t even know that I needed. But as I put on the grounded rose perfume and feel the powerful energy of the stones, I know that they are my treasured companions. Thank you and Blessings! Loved all of the problems I received in my Well Offering!! There were so many goodies in my Well offering. Way more value then what I paid. Everything was beautiful and I got things that I didn’t realize that I needed until I got them. I would highly reccomend getting a Well offering at least once. You will not be disappointed. I don’t know if I can can adequately describe my offering. The value was well over the price point paid. The products were simply perfect. Beautiful stones, perfumes, and tools that all seemed perfect for me.